Our New to us boat is "on the hard," with the bottom to be sanded and primed on Monday. Still at question, is should I apply a Hard bottom paint or an ablative? Looking for a concensus or simply the best course for a boat that will be predominately in Florida waters, yet will start the loop from Florida in April. Could really use some feed back. If your boat is slow less than 10K I would suggest ablative. If you spend any significant time at high speed hard. If you want to scrub the bottom from time to time hard. Thanks for that. Yes, the boat is on the slow side, so the ablative make sense. The boat most likely had an ablative on it, but also had a diver on it about every 8 to 10 weeks.........subsequently it was Scrubbed down to the original surface - nothing left to bond too. I don't know if I can afford to have a diver scrape to often, SO, ablative it is. So if the boat will run slowly (trawler speeds) and particularly if it will experience periods of inactivity at the dock over the course of a couple years, then a hard paint may be better. Maybe I am wrong, but that is how I heard Ted. A Good Reason to go with a Hard Paint. We will be leaving Ft. Myers in April, and should log about 6500 miles in about a year. We'll be moving along quite a bit for a while, but then will become a little more sedentary. It's the months back in Florida that will require more scrappings. If we go with ablative, we end up paying to put in on, then pay someone to scrap it off. Definetly an 'AH Ha!!!" moment. Guess I may see you a long the way. Leaving Fort Myers on or before the 1st of April to do the loop. I used Interlux Micron extra 7 or so years ago and not inclined to do so again. It's hard enough so it needs to be removed. Been there done that and I'm NOT going there again. I helped on that job and it was a very bad experience. If you can pay to have someone else do it thats different but I don't consider it a DIY job. So never again for me. Curious as to how often you are expecting to have the bottom scrubbed while on the Loop? I'm also debating which type of bottom paint to use. Similar speed and planning to do bottom paint in April before starting the Loop. This is what my yardmaster applies to the Coot. Not sure of its properties. I use ablative and operate at trawler speed (I don't have a choice to go faster haha), and using the boat will clean the bottom. Continual use such as on the loop should keep it clean, not requiring a diver to clean it. Even after sitting at the dock for awhile, the bottom stuff sluffs away during use. When it's time for a new bottom paint job, you can apply an ablative without sanding off the residual, whereas a hard paint will build up and eventually need sanding, which costs more money. That's what I put on Willy before we left for Alaska. Lasted at least 3 years but decided it needed to be removed before recoating. Should have had a fully suited up professional to remove it. I hired a man in Alaska to help me. He did 3/4 of the job and I paied him well. Don't know what I would have done w/o the tungston carbide scraper. Terrible work. I hope your bottom is good enough to just add more paint. Of course if you hire a bead blaster or other it's just money. Is that Petit Barnacle Buster on the prop? Didn't work for me. I went back to ArmorAll. Not sure. Would need to research the billings. The propeller always seems to attract barnacles first rather than the hull. Strange. I use the cheapest ablative type I could find. After watching it for years on assistance towboats I ran...I thought it would work for me too. I use Interlude Fiberglass Bottomkote NT. Usually pay 80 to 90 bucks a gallon. When constantly moving on the ICW where you are fresh to salt and back again every week or so, and constantly moving at 6 to 7 knots...my bottom stays clean as new. I do the 2500 miles from Jersey to Florida every winter. When she sits for 5 months during the summer in a high fouling area, when I pull for the annual bottom check and zinc replacement the bottom is usually fouled but not so bad it mostly comes off with a short ride before the travel lift or had I wiped her down once or twice during the summer. But every user and home dock has slightly different needs. While some will say saving money on paint (the last step and possibly the cheapest part of painting)....I say it is equally foolish to waste money on paint that does no better than the cheap one. Granted..just constant moving and salinity changes are probably a bigger factor than the paint. The trick is, you might have to know what works well in your application through experience, a bunch of questions and notes, or trial and error. But I feel pretty confident that looping will minimize the costs unless you stop for long periods. I have to say, Great Responses from All, and it was what I was hoping to hear to help with my decision. The part about THE HARD paint building up and creating a problem in itself - and a need to sand or blast it off(over time), I hear in my wallet. One of the responses begs the question regarding the Painting of the Prop. Our Surveyor recommended NOT painting the props - keep em clean for preformance' sake. However I was told the Prop would be the first place the barnacles will attach. If we are moving pretty regularly on The Loop, that may not be a real issure for a year - especially after we make it to the Great Lakes. Side Note: One of the things that tends to haunt me, is Bumping the Bottom on shifting shoals etc.....as we make it up the East Coast. Being the Positive Thinker(LOL), that I am, having to have the boat Hauled Out for a repair, will be my occasion to Clean the Props. As the loop is mostly fresh water and I will be moving a fair amount, it might need to be scrubbed once. Plan is to paint in the Chesapeake and be on the Erie canal within a month. The rest is essentially fresh till I hit the Gulf of Mexico. Will be bringing scuba gear (hookah) with me. Plan to check the hull monthly. Have had better luck with the Petit spray zinc as opposed to Prop Speed on the running gear. Prop speed is dependent on fast water flow to blow small developing growth off. At 7 knots my skeg was a barnacle farm. The spray zinc worked much better. On the charter boat with its 15 knot speed, the Prop Speed worked well. The hard paint build up is misleading. If you leave the boat in the water year round and paint every 2 or 3 years, it will take decades to have a significant build up. Put hard paint on my charter boat every spring for 12 years. 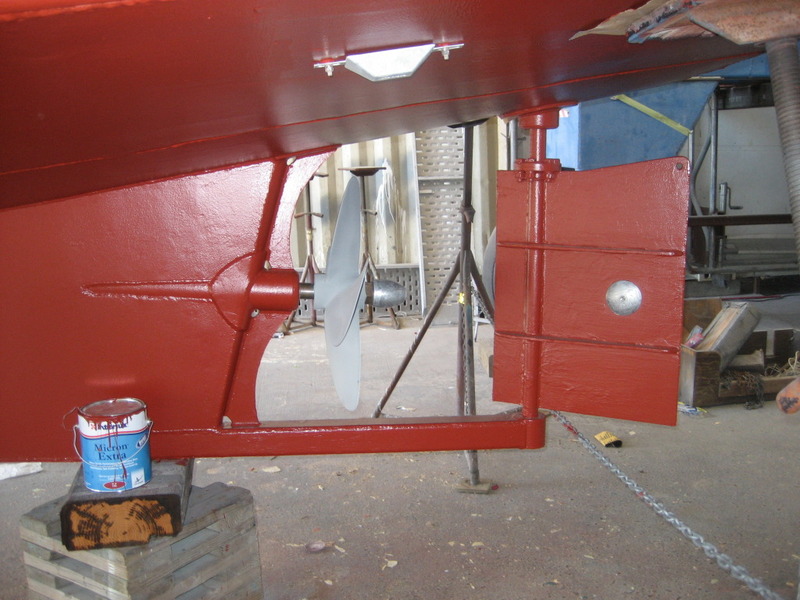 That and the preceeding 24 years of paint was enough to require sand blasting the hull. I have been using ablative paints for 20+ years. I put a marker coat on in a different color then top coated with the desired color. When the marker shows through I repaint, or sometimes just spot paint. My boat never goes more than 7 knots except for a few minutes each spring when I run the engine up to full throttle. I have never had growth beyond a little slime and have never had a diver clean the bottom. As far as the prop goes, I have had a few small barnacles but never more than one or two. I do polish the prop each spring. The advantages I see of for ablative are no build up and being able to repaint with no bottom prep other than pressure washing at haulout. For the last 10-12 years I have been using Petit Hydrocoat. Last spring I switched one boat to Sea Hawk Monterey water based ablative and kept the other with Petit Hydrocoat. The Sea Hawk worked a bit better (less slime) and cost $25-$30 a gallon less so I will use it on both boats next year. I will second the shout for Hydrocoat and Sea Hawk, both are great in New England waters. Using two different colors lets you paint only the worn spots. As to smoothness, you can get a smoother bottom with hard paint, but you can keep a smoother bottom over years with albative paint. Use the brand that works best in your local area. When we were in Alaska I used Pettit Sea Mate. Went to the hardware store and there was a huge pyramid of gallons on the floor. It was obvious people there rarely used anything else. We had tide grids too so cleaning a bit and adding another coat of antifoul was cheap and easy. The Seamate was $80 gal.